Khalil Andani will be giving a presentation as part of the Annual Symposium organized by the The Near and Middle Eastern Civilizations Graduate Students’ Association at the University of Toronto. The nature of knowledge has been a great concern for many theologians and philosophers throughout human history. Knowledge is fundamental to the worldview and thought of Nasir-i Khusraw – a renowned thinker, poet and sage of the eleventh century who belonged to the Shi‘i Ismaili branch of Islam. For him, the Cosmos has been created for the purpose of knowledge and its acquisition by human beings. 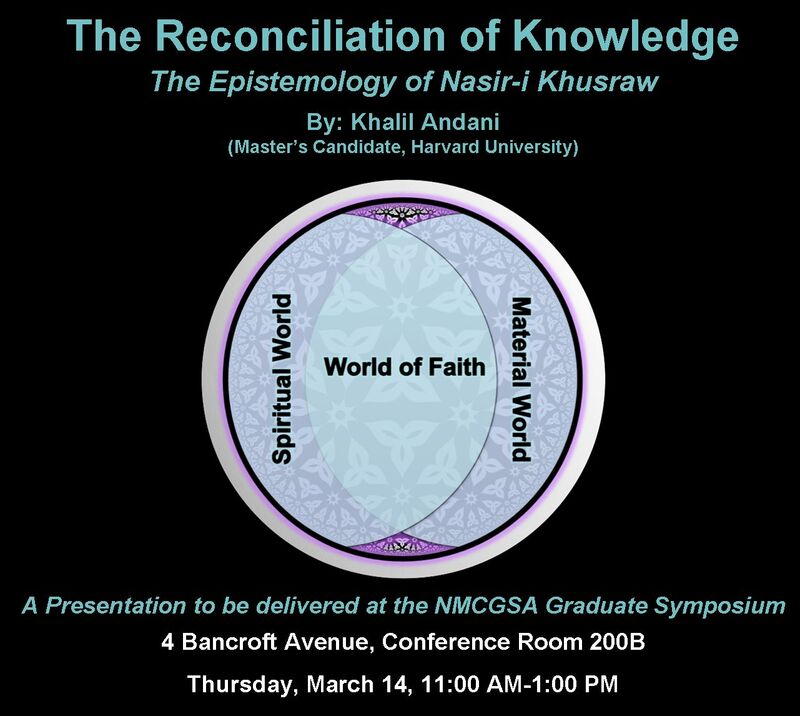 This presentation will explain how Nasir Khusraw presents two modes of knowing: intellectual-perceptual knowledge, and acquired-conceptual knowledge. Nasir regards both kinds of knowledge as complementary stages in the spiritual journey that culminates in the recognition of the oneness (tawhid) of God. Was this session (Khalil Andani’s presentation on Mar 14 at NMCGSA Graduate symposium UofT) recorded and do you expect to post these videos on your web site for general on demand viewing? We have been told that this was not video-recorded. However, presenter might be able to share the audio when ready.